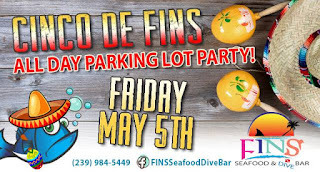 FINS Seafood & Dive Bar, located at 3422 Del Prado Blvd. South in Cape Coral, is hosting “Cinco de FINS Parking Lot Party” Friday, May 5 to benefit Hope Hospice. Managing Partner Kelly Feather said she chose Hope for this event in memory of her stepmother Gwen Hope Feather, who served as Hope’s Director of Patient Services and as a member of Florida Gulf Coast University’s Social Work Advisory Board. The taco eating contest and piñata bashing event will be held from 11 a.m. to 11 p.m. Admission is free, and guests will enjoy special pricing on food and beverages. Preregistration is required. For more information, call 239-984-5499 or visit FINS Seafood & Dive Bar on Facebook. Your online vote can help us win a grant through ACT (A Community Thrives), sponsored by USA Today. Debbie Regnone, owner of Resort Sports, has submitted a video entry for a ‘Superhero Campaign’ for Hope Kids Care. Vote on her page at act.usatoday.com/submit-an-idea/#/gallery/60426536 once a day until May 12. Hope will receive $50,000 or $100,000 for this program if we win! Special thanks go to Debbie for her thoughtful submission. Hope Healthcare is hosting the 16th annual Southwest Florida Conference on Aging, a multi-disciplinary conference for health care professionals, older adults and family caregivers. The conference offers education on generational aging; elderly exploitation; senior social issues; postoperative delirium; and self-advocacy and medical conditions and will conclude with a conversation about gratitude. The conference takes place from 8:15 a.m. to 4 p.m. on Wednesday, May 17 at Crowne Plaza Fort Myers at the Bell Tower Shops, located at 13051 Bell Tower Drive. Registration is $85 for licensed professionals and includes six contact hours; $70 for United Way Partner Agencies; and $50 for caregivers, students and the public. Registration fees include lunch and program materials. Presenters for the conference include Glenn Gutek, Atticus Practice Management Systems; Heather Conley, Department of Children & Families; Dr. Thomas Felke, Florida Gulf Coast University; Dr. Ajay Mayor, Lee Health; Dr. Susan Cassidy, CriticalMD; and Jonathan Scalone, Hope Healthcare. The Conference on Aging is sponsored by Prather & Swank, P.A.and hosted by Hope Healthcare in partnership with Arden Courts, the Area Agency on Aging for Southwest Florida, Florida Gulf Coast University, Lee Health and United Way of Lee County. The registration deadline is May 10. To register online or to print the registration form, visit Donate.HopeHCS.org/COA17. For more information, call (239) 482-4673. Doors open at 7:45 a.m. While working with George, one of Hope's spiritual care staff noticed that he had very charming notes in his room. 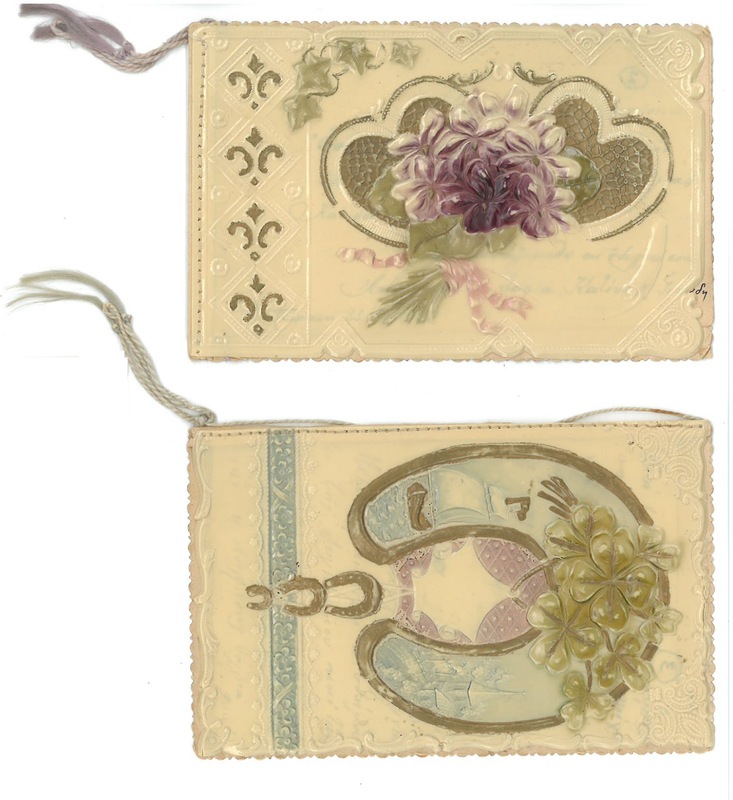 Although George couldn't explain exactly what they were, it seemed as though they might hold clues to the important people in his life. And, since it is often easier for people to recall long-term memories when prompted, these references might help provide new avenues of conversation. 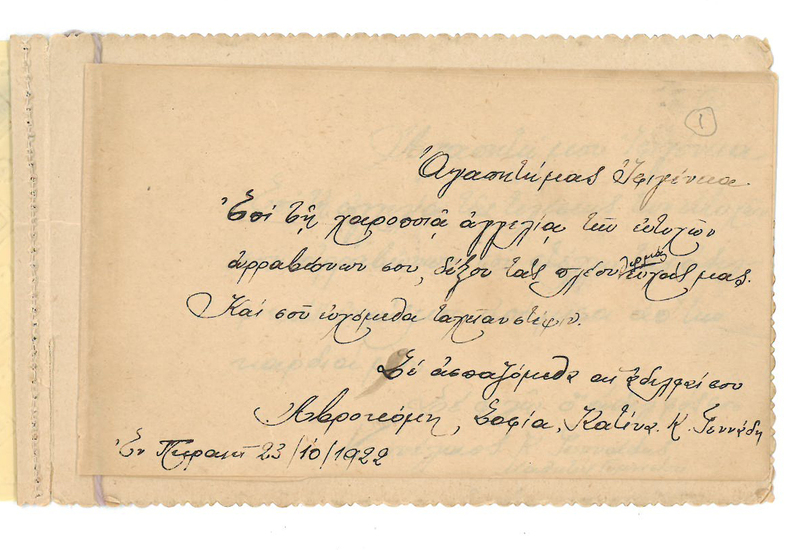 The text of the nearly 100 year old notes was originally in Greek. 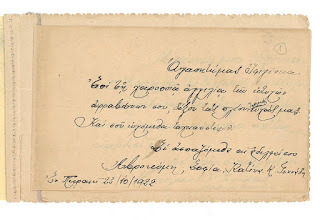 Fortunately, Father Dean of Annunciation Greek Orthodox Church was able to translate some passages so that we could ask George more about them! On the event of your happy marriage, we send our wishes. We wish your life to be full of flowers and sweetness, never finding it difficult, full of thanks, happiness and joy, and fresh flowers to surround your life. On the event of your marriage, accept my motherly and heartfelt wishes. The jasmines and the laurels, lilies, and myrtles I send, and I shower you with wishes. And my wishes are - to have joy in your hearts and the smile never to leave your cheerful lips. I do not have flowers to send to you. So to shower you with happiness, instead I send my wishes from the depths of my heart. I wish you long life, for you to never face grief, sorrows and tears, and for the joy in your life to always increase. 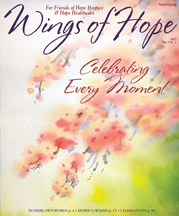 Read about the individuals in our care, see event photos, and learn about the many Hope programs and services available in southwest Florida in the newest issue of Wings of Hope magazine.